Leaving VIR, next stop was the "Slay the Dragon" Hill climb in Robbinsville N.C. - an impossible mountainous, no interstate drive from Alton VA. 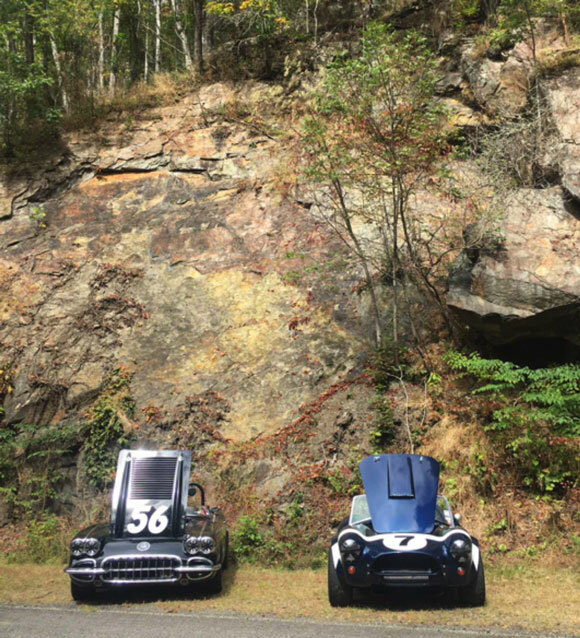 The "Slay the Dragon" Hill climb was located just east of Deals Gap on the North Carolina–Tennessee state line. The main road in is US 129. Fortunately, the Duntov rig came in from the Northeast, as coming in from the west, you have to go through the event's namesake also known as The Dragon or The Dragon's Tail. While it is one of the most exciting roads in the country for motorcycles and sports cars, it is definitely not semi-trailer race car transporter friendly, with 318 curves in 11 miles. On any day, thousands of motorcycles and sports cars venture, skid, slide and twist the 318 turn mountain road - zooming past ominous yellow signs noting "Caution - High Crash Area" as well as the ambulances and State Police at 3 mile interval checkpoints along the route. The police only seemed to become involved if there appeared to be any alcohol usage or to assist mopping up the mess of the inevitable mistakes in judgment. The 30 mile speed limit seemed to be only enforced on the straights stretches - of which there are few. 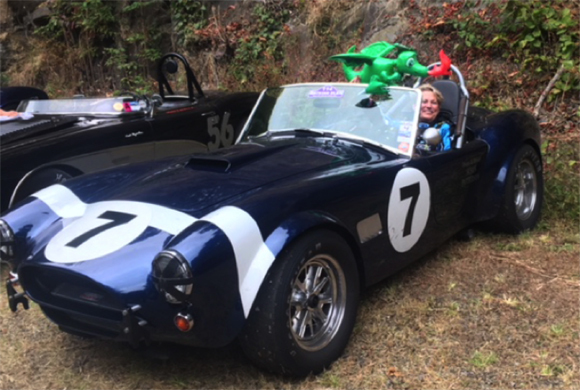 Susie and her husband flew into Knoxville and drove The Dragon, while Colby - who drove down from Columbus on Saturday to be with the gang - actually went back and forth a couple of times in his ATS - playing with a puzzled group of motorcycles as to how a street car handled so well. He arrived at the hill climb with a broad grin and stayed only long enough to make an appearance before stating that he was going to go drive the Dragon a bit more. Duntov Crew Chief Clete Wilden on his way by ankle express to find a restaurant in a nearby town. 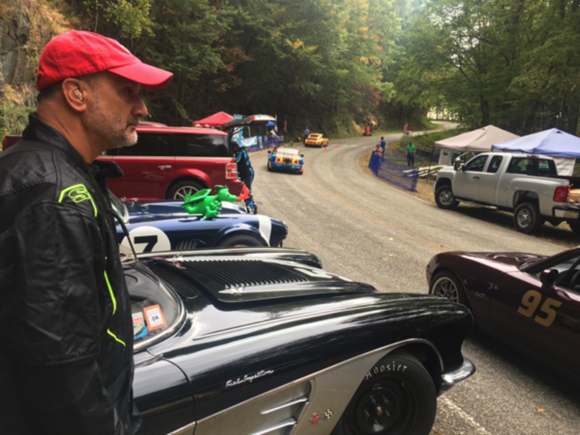 This was SVRA's first hill climb event, and unfortunately all but a few SVRA racers missed it! The event was called after Saturday due to an inbound hurricane, but it was fun while it lasted. The Duntov team learned not to bring a big trailer to a hill climb, as there was no room anywhere near the track to park! They staged at a lumber yard twenty miles from the event, and the racecars had to be driven to the track. What the event lacked in convenience, it made up for in scenery. Tony surveys the scene as the event gets underway. Susie and the event mascot, a green inflatable dragon.